"MSG-3 based aircraft maintenance programs"
Can Safe Aircraft and MSG-3 Coexist in an Airline Maintenance Program? How can an air carrier take advantage of the MSG-3 based aircraft maintenance programs? In the aircraft maintenance world, MSG-3 is the root of all inspection schedules in a process starting before an aircraft enters service. Here is a look at this fascinating process of how manufacturers and operators work to achieve the end result. This whitepaper examines the development of aircraft maintenance program logic and offers suggestions for realizing the full safety of those developments. What are the three broad processes introduced by MSG-1 to classify the scheduled aircraft maintenance requirements? What are the four basic objectives of an efficient airline maintenance program generated by MSG-3? What are the MSG-3 requirements and the mandatory maintenance requirements generated by compliance to FAR 25.571 that a new aircraft usually have? 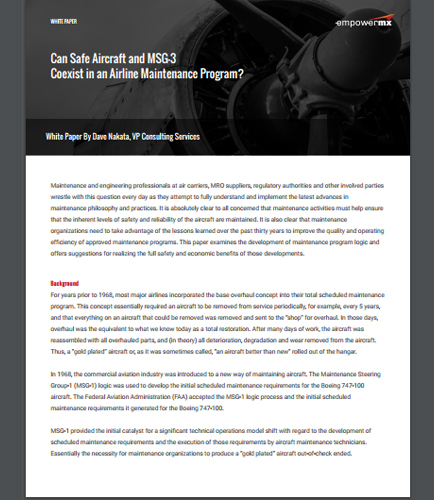 Download this informative whitepaper to make the first step in making that necessary culture change and achieving the economic benefits of MSG-3 maintenance program in an air carrier’s maintenance organization. Artificial Intelligence involves incorporating features in machines that mimic human intelligence and cognitive attributes like self-learning, visual perception, speech recognition, logical problem solving, and decision making. The Artificial Intelligence field aims to solve human intelligence and put its features in software, robots, and machines in general for increased efficiency in performing tasks that exceed common mathematical boundaries and human capacities.